Cooper Energy – an Australian gas and oil exploration and production company – was questioned at its annual general meeting (AGM) today about how climate change would affect its business. Oil and gas companies are clearly vulnerable to the impacts of climate change, including global policy decisions and the risk of stranded assets. One shareholder today asked if Cooper’s investment decisions, such as their Casino Henry and Sole projects, would be stress tested against different climate scenarios. Chairman John Conde made it clear they would not base their investment decision on climate change.”The variation that might be cause by climate change is a very low order,” was his response. Shareholders should be concerned about such comments in light of recent data, such as Oil Change International’s report which has determined “Even if all coal mines were shut down tomorrow, the gas and oil in already-developed fields alone would take the world beyond the carbon budget for a 50% chance at staying below 1.5ºC of global warming”. climate policy scenarios, including one in which global warming is contained to 2ºC or less. The board’s responses to shareholder questions today didn’t dispute any of this. When asked if the business is aligned to a particular energy scenario, the chairman stated that “we don’t have that in Australia. We don’t have something to respond to in that regard”. ANZ is a major funder of Cooper Energy’s Sole project. This project will help Cooper energy expand their fossil fuels significantly. 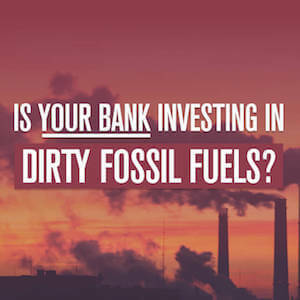 Tell ANZ to stop funding companies that are putting a safe climate at risk.